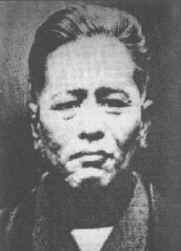 Chojun Miyagi (1888-1953) is the founder of today's Goju-Ryu karate-do; he was responsible for taking Naha-te and formulating it into a system. Miyagi was Kanryo Higaonna's most talented and chosen pupil. Miyagi came from a rich family of high esteem, ship-owners who imported -amongst others- medicines from China and supplied these to the royal family, the government and business houses. To prepare him for his future task to lead the family, when only eleven years old Chojun was brought to Ryuko Aragaki (1875-1961), who on his terms sent him at the age of fourteen to Kanryo Higaonna. Here Chojun Miyagi, together with Juhatsu Kyoda (1887-1967), was tutored thoroughly in Higaonna's Naha-te. After the death of Higaonna the well-off Miyagi, who occupied himself full-time with the study of martial arts, planned a trip to Fuzhou, the Mecca of South-Chinese fighting arts (Nan Quan), to visit the birthplace of Kanryo Higaonna's Naha-te and to pay his respects to Ryu Ryu Ko's grave. For two months Chojun Miyagi together with Aisho Nakamoto (1881-1945) stayed in Fuzhou to train and they also visited the Julianshan Fujian Shaolin Temple. Miyagi dedicated his whole life to the development of what was called 'toudijutsu' (China hand art) or simply 'te' on Okinawa. In 1921 crown-prince Hirohito visited Okinawa before traveling to Europe. Due to his visit Shuri-te as well as Naha-te (by Chojun Miyagi) was demonstrated. In 1933 Chojun Miyagi registered 'toudi' officially as Goju-Ryu at the Japanese regulating Budo-institution, the prestigious Dai Nippon Butokukai, the All Japan Martial Arts Association. Later on Miyagi was distinguished by the Ministry of Physical Education, receiving the highest honour of the Dai Nippon Butokukai and was appointed representative of the Butokukai department for Okinawa. Thus Goju-Ryu karate-do -the name derived from the Bubishi- was the first and eldest karate-tradition recognized by the Dai Nippon Butokukai; its founder, Chojun Miyagi, acquired an outstanding position in karate-do.